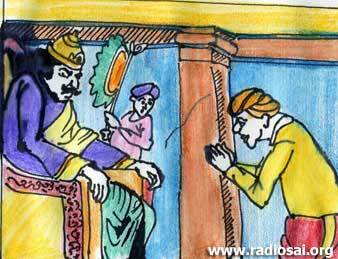 King Ambarisha performed a Yaga, but at the crucial moment, the animal intended for the sacrifice escaped. Now the priests ordained that to make amends for this sinful neglect, a human being should be offered as a substitute to the Gods. The King promised 1,000 cows in exchange for a son, but which father will send a son to death, even when 1,000 cows are given in exchange? There were also other conditions: the King’s messengers should not ask anyone for the son. They should not commit the sin of equating 1,000 cows as equal to a human being. The father too should not break the sad offer to the son. The offer to immolate himself must come unasked from the son, without any prompting or persuasion. It is only such a son that will be accepted by the Gods. Now, Sunasshepa heard the news by himself and approaching his father he said he would go, and gladly too. For, what greater good fortune can a mortal expect than ascending to heaven through the sacrificial flame? Sunasshepa persuaded his father that his wish to proceed to the Yajna and offer himself was legitimate and approvable, and left for the capital. 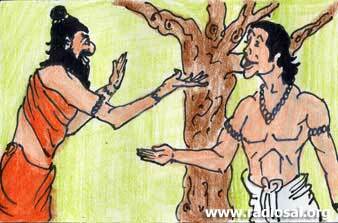 On the way, he went to his maternal uncle, Viswamitra, who tried to prevent the boy from going to the sacrifice. “This is all just foolish superstition. Can any one substitute a man for a cow?” Viswamitra asked. Sunasshepa replied that all men are cattle, for until Viveka and Vairagya (wisdom and renunciation) dawn, they are but animals. So, in spite of his uncle’s arguments, arguments like the ones used by some to dissuade persons from coming to Puttaparthi, Sunasshepa managed to reach the Yagasala. In the same way as the lights before us are lit when a switch is moved up at Penukonda (which is 40 kms from Puttaparthi), when the Lord decides on something, it has to happen so. Well, the Lord is not a rock or a stone. His Heart melted at the plight of the boy. Indra appeared in the sacrificial fire and departed showering blessings on his head. It was Indra who had carried away the original cow and elaborated this entire plot, to bring Sunasshepa and his greatness to light and to bless him.